Everything in this universe is in constant motion. Even for two consequent moments nothing stays exactly same. And yet, for the most part, change is so slow and sublime that it remains undetected. Nature is not in a hurry, it’s impossible to see a tree grow. Even with our own kids, we only come to know that they’ve passed through a growth spurt when their clothes don’t fit any longer. The same is true about us, society and the world at large. That’s why history is such an important subject to engage in and study. Keeping records likewise allows us to compare. As things are, we’re embedded in the eternal moment of the Now. We’re in the mirror, one with its surface, part and parcel of the picture. Astronomers are able to predict where celestial objects are at any given future moment. This is so because they neatly observe the planets’ trajectories, taking into account gravitational fields and disturbances which these objects will be affected by. In much the same way, analyzing history allows us to extrapolate, be it for the individual or for societies at large. Knowing history gives us the bird’s eye’s view. Looked at from great distance our lives and world reveal their underlying patterns. In the blink of an eye we see of how immensely different things have become. We get an idea of what dynamic processes we and the world around us are involved in. 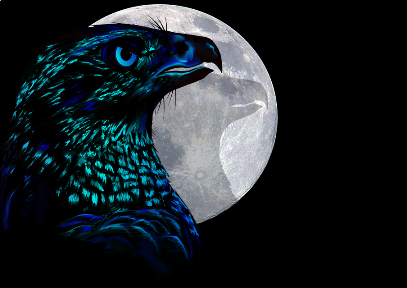 To no surprise, the eagle symbolizes ‘power of vision’. Soaring high above the world makes everything become obvious. Things appear within a context, such overview results in clarity. There’s no need to run in mental circles, trying to figure things out. Belief becomes unnecessary, it's replaced by knowing. Astrology is astronomy’s twin sister. It’s not even three centuries since the two were separated and pushed into opposite corners. As far back as records exist, astronomy always has been astrology’s servant. The main reason to engage in astronomical observations was to study the synchronicity of heavenly phenomena with life on Earth. The fact that astronomers like Galilei, Kepler and Newton have been famous and well respected astrologers is well suppressed and not known by too many people. It’s been the unholy alliance between Catholic Church and an uprising rationalism which pushed astrology out of the picture. The church was (and still is) afraid that people may get empowered by adhering to cosmic law. Because then it would become impossible to control the masses with a Damocles sword of irrational fear. Rationalism on the other hand, originally playing the role of the atheistic antipode, promised to liberate people from the all-powerful Church. However by denying all which cannot directly be seen or touched, rationalism turns this world into a poor, soulless and mechanistic battlefield. Art history presents a particularly powerful mirror, revealing the stages human psyche has been evolving through. Just last week I happened to watch a documentary on Knowledge Network, on how dramatically the concept of the Devil changed through the last two millennia. 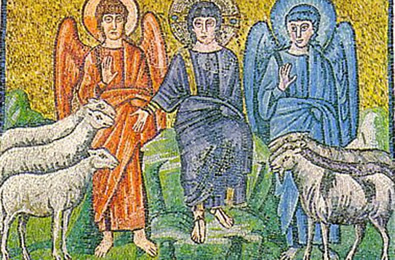 In a 6th century Ravenna mosaic we see Luzifer, the fallen angel, still part of cosmic hierarchy, at God’s left side. 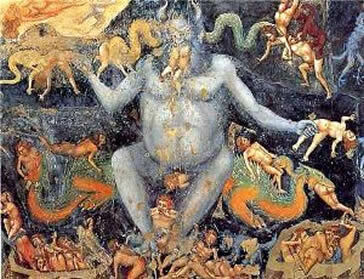 And by the 14th century, as depicted by the Italian painter Giotto, the Devil had turned into a vicious, sadistic and obsessive monster, pretty much of what he’s known for to this day. The 6th century concept of the fallen angel portrays our shadow. It depicts the ego that has split off, separating itself, falling out of unity, absorbed by its own agenda. By the 14th century however, this same energy had become fully externalized, taking on a powerful life of its own, threatening all those who would dare to question and not surrender to the Church’s stronghold. We might be tempted to think that there had been great progress through the past centuries. Upon closer examination however one has to admit that despite the impressive technical advancements, human psyche is still stuck in the same medieval controversy. It’s a mind-boggling riddle how deep the abyss yawns between irrational, fear-based blind beliefs on the one side; and rational, soulless and materialistic staleness on the other. Recognizing that this is the predominant condition of human mind at the dawn of the third millennium might be the first step towards healing! On September 29, Mercury entered the fixed water sign Scorpio. Mercury has an interesting rhythm. Every four months it catches up with Earth, to move between us and the Sun. Roughly 10 days before pulling even, Mercury appears coming to a halt. Then for roughly three weeks (October 21 – November 10), Mercury retreats backwards through the sky. 2013’s three Mercury retrograde periods are in water signs, Pisces, Cancer, and now Scorpio. Remember, this is the year of the Water Snake, which is about shedding skins and fundamental changes. 2001 and 1989 were Snake years. Everybody remembers 9-11, and probably most of us do recall the fall of the Berlin wall. For more than nine weeks, till December 4, Mercury will be in Pluto’s realm, Scorpio. As we already can see, this period brings profound rearrangements; events that may shake things up. Schemes might topple, creating space for new and innovative approaches. The challenge is to think out of the box, to be creative and probe for solutions that have not been tried before. With Pluto’s support, structures might get torn down, suddenly and quite relentlessly. At the peak of Full Moon, on October 18, (which also is a Penumbral eclipse), the zodiac wraps around Earth in exactly the same manner as it did 14 days earlier at New Moon. This is highly unusual, providing one more clue that October 2013 indeed marks a great turning point. In Celestial Rhythms of week 40, I predicted that the October 4 New Moon pretty much would set the tone for the rest of this year. In that same article, I predicted that the US government shutdown would eventually bear grave consequences. As we’re approaching Full Moon there’s no solution in sight. The debt ceiling will be reached by October 17. The Tea Party extremists are living in delusion, they're disconnected from reality. They’re of the caliber of Muslim suicide bombers, obsessed by irrational beliefs that defy reality. The US 'People's chart' of July 4, 1776, shows that their situation is getting increasingly difficult over the course of the coming months. The US are in a 22-year phase of readjustment, reflected by progressed Mercury moving backwards, resuming dierct motion by August 2016. It's furthermore very remarkable that the July 4, 1776 progressed Mars turned retrograde in 2006, initiating an 81-year phase of backward motion. The fact that for most of the 21st century the American progressed Mars will be retrograde is highly revealing. It may indicate a deep quest of how power and force are applied. Today’s watershed is at 3:05 p.m MDT, when the Moon changes into Pisces. Before that, while in late Aquarius, the Moon advances to oppose planet Mars in the very last and critical degree of Leo. - Kan, Seed days tend to be quite edgy, wired and competitive. The Mars opposition adds some kamikaze energy into this cocktail, hence expect some eruptive and go-getter urgency. Inner guiding sign Eb, Heart of the Human, reminds us that our human experience involves the entire palete, and that even darkest feelings are deeply enriching. Close your eyes, bring your focus to your navel. The Serpent resonates with survival themes. 2013 is the year of the Water Snake. This day might go into the annals. Something thoroughly shaking might happen, a breaking open, or down – depending on how one would like to look at it. There might be a touch down with existence, awakening and reviving the connection to and with our instincts. - Mars enters earth sign Virgo and the Sun opposes Eris. Named after the Greek goddess who triggered the Trojan War by throwing a golden apple into the round of gods. This 2003 disovery would eventually challenge the hierarchy of the planets. Pluto had to give up its place amongst them, which would cement the number of planets to eight. Pluto’s consolation price however was that all the many newly discovered objects in similar orbit would be classified as Plutinos. Pluto in that sense became the headmaster, the medium giving voice to the many. So far about fifty planetoids have been discovered who share the same 2:3 resonance with Neptune. This makes Neptune the lower fifth (and Uranus the octavated fifth) of the Plutinos' energy. The Pisces Moon is void-of-course for the enitre day. Only in the evening, at 7:17 p.m.MDT as the Moon moves on into Aries, the energy will shift. – Cimi, the World Bridger is the sixth of the twenty day signs. It lays a blanket of peace and forgiveness over that which is. Six is a strong structural number, resonating completion, perfection - and therefore ending. When things are complete they have to disappear again, there’s no way to go any further. Etznab, the Mirror is the guide, promoting transcendence through peak experiences. A great day to meditate and heal the world. A dynamic Aries Moon at the eve of a Penumbral Lunar eclipse has a perky and whimsical side to it, to the point of bizarrness. May I introduce Comet ISON, which supposedly will perform exceptionally. Predicting the finish of a comet is tricky, however astronomers generally agree that we may be in for something as impressive as Hale-Bopp in 1997. Three days ago, Mars entered the sign of Virgo. For seven weeks, till December 7, the Red planet will show off, prospering in proactive and methodical undertakings. Lamat, the Star represents strife for excellence. It’s time to polish the facets of the diamond to utter billiance. Lamat is courageous and combative, carrying the atmosphere of excitement, ready to face challenges headon. The Moon in Taurus exhibits a complacent and well grounded feel. Integrating duality is the theme of this emotional and dreamy day. Muluc, the Moon, is represented by water. Water resonates with the essence of our soul. Whatever the shape of our vessels may be, the content is univeral, at a deep level we're one. Contemplate on what we all have in common; practice empathy and forgiveness. The various characters we attract into our lives are mirroring aspects of ourselves, representing our past and future. There are only four Season days within each 260-day period. All of them carry the adjective Electric. 'Three' days are the motors of the 13-day cycles. Bonds created on a Season day may prove very important. There’s a strong magnetic energy at work. Magic is possible, it’s all about being in the right place at the right time. Sunday night might offer itself for an inspiring dinner party. However, take in account, after 3 p.m. the Moon runs void-of-course (V/C) in late Taurus.